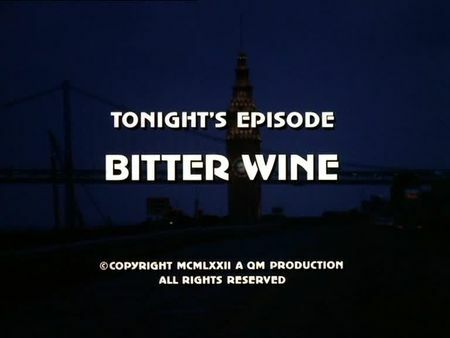 I have just added the screencaps for Bitter Wine to the episodes' page. Jason Kampacalas, son of a Greek restaurant owner, returns after twelve years in San Quentin for manslaughter. His family maintains the Greek Taverna, a downtown restaurant, and also owns a vineyard just outside San Francisco. The family business is managed by Jason's older brother, Dimitri, and we soon learn that it was the latter who actually killed the two children in a car accident for which Jason was detained and convicted - for the good of the family, as Jason thought at that time. Furthermore, the business is not running too well, however, there's little talk between Dimitri and his old man about ventures. On the other hand, Jason is not very welcome to his father who obviously repudiated his son for the killing of the two children, but his loving sister and his youngest brother keep his hope of a peaceful future alive. Soon, there is trouble and anger between the two brothers as Dimitri has not kept his promise to explain to their father what really happened twelve years ago. Following a fire in the restaurant, killing one of their employees and an old friend of their father, Mike and Steve need to investigate for fire raising and murder. The opening of this episode takes us to San Quentin penitentiary as well as downtown, to Columbus Avenue to be precise. Most of the filming was done on the vineyard outside of San Francisco, and on a spot on Potrero Hill, where the former house of the Kampacalas family becomes a temporary home for Jason who sleeps overnight in the condemned building. Dimitri is living in a decadent apartment on Telegraph Hill, where a nice inside-sequence was taken on the terrace, offering a great view of the waterfront with elevated Embarcadero Freeway and Bay Bridge in background.